According to this news item on PC.ign.com Valve has announced that Half-Life 2 will go Gold on Monday. As soon as we know the retail date, youâ€™ll know, so stay tuned! Now if youâ€™ll excuse me I have to go and scare the cat by completely freaking out in a very unadult manner. Update: The folks at Gamespy also have a news story up on this. Thanks to Ingolfson for the link. So I guess those of us who bought the Radeon 9800 Pro with the promise of a free download of Half-Life 2 will have to continue twiddling our gaming thumbs while waiting not-so-patiently. I wasn’t really expecting it until later in September, anyway. Actually, I’m not really expecting it at all. That way I won’t be disappointed. 😆 Hopefully I’ll be able to find my coupon with the key on it when ever it gets released. 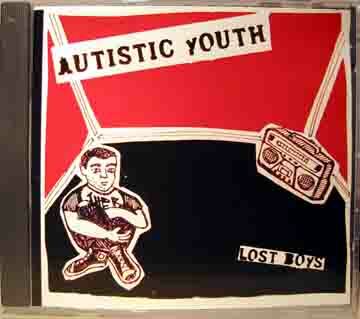 Go to autisticyouth.com for ordering info and downloadable mp3’s. Portlanders love their city for its relaxed pace and natural offerings: The city sits at the nexus of two great rivers, surrounded by immense forests and hushed volcanoes. They are just as proud of their downtown art galleries, eateries and brew pubs as they are of their wilderness. Politically conservative folk and go-go business people should avoid this metropolis of 1.9 million. Most residents are strictly liberal and favor slow growth. Say what? 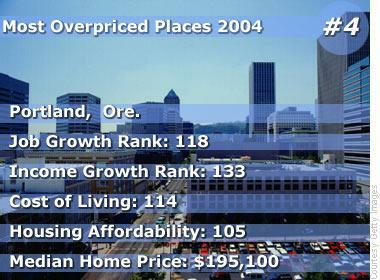 Wasn’t Portland just voted #4 on Forbes’ list of most overpriced places to live? 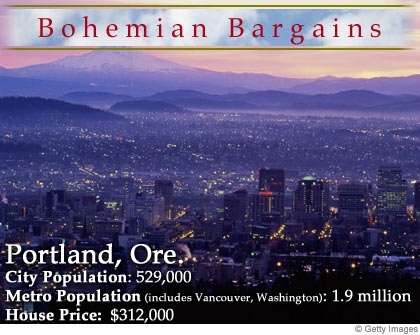 How come we’re all of a sudden a “Bohemian Bargain?” I think Forbes is a bit confused. At least they warned the right to go elsewhere. 😆 And it’s a nice shot of the city. From the Pittock Mansion, it looks like. Googling Persistent Illusion now has persistentillusion.com popping up first. And it’s this site, not the old location on mommymonster.com. Strangely enough, Googling mommymonster also returns persistentillusion.com as the first hit, but mommymonster.com is now the second hit, which is an improvement for it. Googling Mommy Monster doesn’t return either on the first page. 😥 Ah well. Sometimes she would hang our sheets to dry in the sun. Oh… they smelled so good. There was nothing like sliding between a pair of crisp, white sheets with that delicious scent at the end of a hard day of play. I don’t care what perfumes the fabric softener companies use, they don’t even come close. Always white, always cotton. Cotton was the best, Mama said. It occurs to me now that white cotton sheets can be bleached, and that was probably the reason. But Mama was right about the cotton and now I know why. Like Mama I’ve always purchased cotton sheet. Unlike Mama, I’ve always purchased cotton sheets in colors. I never paid that much attention to thread count. I just bought what I liked that was on sale. I haven’t bought any new sheets for a long time. The other night I crawled into bed and stretched out… and put my foot through the sheet. OK, the sheets have been around awhile. I lay very still, hoping that it was only a small tear that would somehow mend itself during the night. But every time I rolled over, the sound of tearing woke me up. By morning, the sheet had turned itself into rags. Time for new ones. We don’t have an I D Store in Portland, but we have Fred Meyer, which is relatively similar. So off to Freddy’s I went. It was not a good day to shop. I didn’t feel good, and my mind was mostly on getting home. I grabbed some sheets that had a nice blue pattern and that promised to fit extra tall mattresses. When I got home, I threw them in the wash. I noticed that they didn’t have a very nice “hand,” but I assumed that washing and softening would cure that. But they came out of the dryer feeling just the same. So I looked at the lable: 40% cotton, 60% polyester. Ugh. But I put them on the bed. I mean, how bad could they be? Would you believe they were just like crawling into bed with a leisure suit? A very stiff, scratchy leisure suit. Blech. So today I went down to Bed Bath & Beyond, where I thought there would be a fairly large selection of 100% cotton sheets. And there was. It was almost overwhelming. And they have samples out, so I could actually feel what the sheets were like. I felt everything from 200 thread count to 1000 thread count. That’s right — 1000 threads/inch. I didn’t even know that was possible! I looked very hard at sheets woven of a natural fiber made from birch. They were very soft, but I’m not familiar with the fiber, and they were very expensive. I decided to stick to cotton. I was very tempted by the 1000 thread count sheets. Very tempted. But then prudence, and pocketbook, won out and I picked out some nice 300 thread count sheets in a nice taupe. Then I saw the 600 thread count sheets that were on sale. They were cheaper than the 300 thread count sets. A lot cheaper. And 600 is more than 300 (if not as much as 1000). So I picked up a set in a nice sage and put the 300 thread count set back. These felt a lot better going in the washer, and even better coming out of the dryer. I can’t wait to slide between them. No more leisure suited bed for me! But I will be in the lap of luxury. Mama was right. Cotton is best. “We need to improve the business climate of the Portland area, because we are racked with some of the highest unemployment rates and the lowest job-creation rates in the country. Those are unacceptable.” Those were the words of Jonathan Schlueter in an Oregonian interview after he was named the executive director of the non-profit Westside Economic Alliance in Portland. During the tech boom, Oregon became a desirable destination for professionals hoping to find an affordable alternative to the Bay Area, but it ended up driving up the cost of living, and the job market hasn’t quite caught up. And people wonder why I hang on to my job and my house. Click here for the Forbes article.